This is Hairy Larry inviting you to enjoy Something Blue every Saturday night at ten. This week we’re featuring Brick Fields, Divas On Fire, and tomatoband. For more about the show visit the Something Blue website at http://sbblues.com. Oh yeah, that’s Diva’s On Fire singing “With a Little Help from My Friends”. I love the fantastic harmonies. Before that we heard two songs from “Blues Habit”, the new Brick Fields CD, “Ain’t Got Nothin but the Blues” and “Jericho”. Rachel Fields is the lead singer in Brick Fields and she also sings with Diva’s On Fire. I’m Hairy Larry, host of Something Blue. Visit the Something Blue website at http://sbblues.com to listen anytime and for clickable links to more great music from our featured musicians. The Arkansas Arts Council presented Rachel Fields with The Individual Fellowship Award for Arkansas Performing Arts and Music composition. Rachel’s husband, Larry Brick, writes songs and plays guitar, backing her up. They both have a lifetime in music including gospel, jam band, and the blues. Here they are now with “Belly Of The Whale”. Then we’ll hear tomatoband do “Oh Jah Din”. Now that’s what I’m talking about, Rachel Fields singing “Lottie Day” and “Blues Habit” with Divas On Fire. Also singing with Divas On Fire are Dawn Cate, “Lectric” Liz Lottmann, Ocie Fisher and Tori Rudolph. “Lectric” Liz is from Jonesboro and she has been featured on Something Blue before. Rachel’s been everywhere, singing the blues, but she has Arkansas Roots and wherever she goes we’ll always take credit. She’s got the blues to her soul and you can hear it when she sings. I’m Hairy Larry, host of Something Blue. 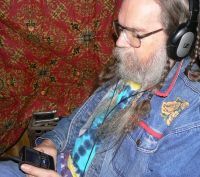 Friend me or message me on Facebook and to keep your timeline updated with music from the Delta, friend Delta Boogie. In fact I met Rachel Fields on the Delta Boogie facebook page. I want to thank her for helping me with the research for this show. And thanks to the Live Music Archive for hosting the tomatoband concert. Here’s tomatoband now, recorded on August 3, 2017, at the Charleston Pour House. Their jam band sound draws on jazz and blues with a healthy dose of Frank Zappa. Closing the show we’ll hear “Rats” and “Cushion”. This entry was posted in Shows and tagged Blues, Brick Fields, Divas On Fire, Jazz, tomatoband. Bookmark the permalink.